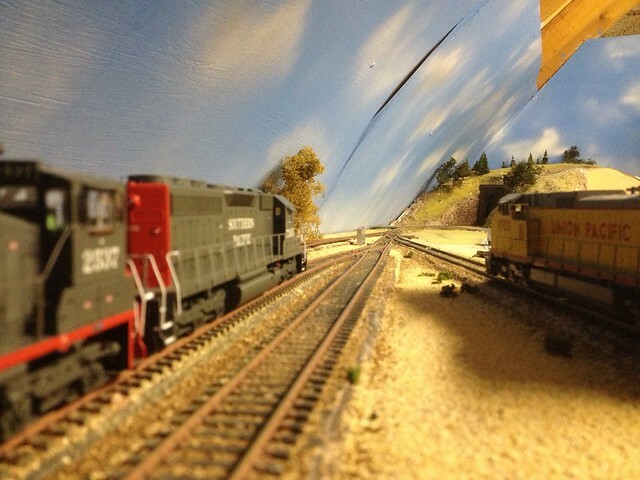 Here's a little bit of railroad action on my layout. 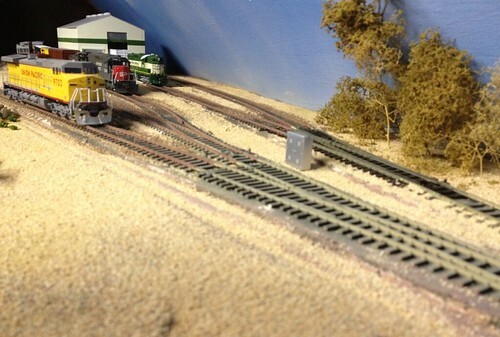 I will introduce my layout in a future post in a bit more detail, for now , let's watch a few trains. Ok as promised a bit more detail. Here's the trackplan. I started to develop this plan when looking for a small size switching layout, based on an area in California, where the SP would operate. 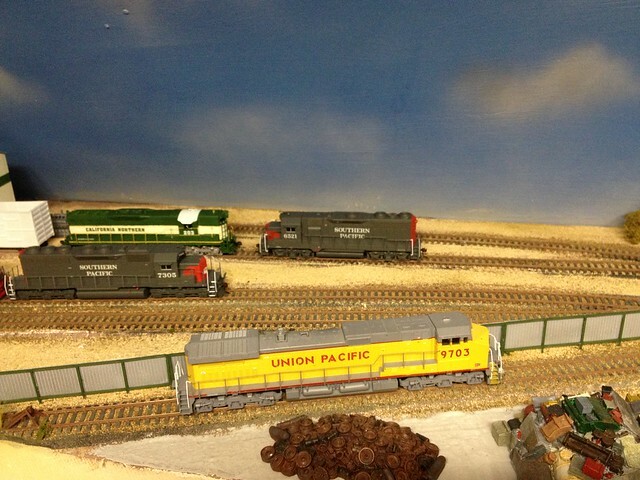 A couple of influences can be mentioned here: Pele Soeborg for his beautiful California desert scenery, Joe Fugate for his Siskiyou layout, and Lance Mindheim and his switching layout approach. It started with an L shape design, which is most of the left side of the track plan, plus the top side. I then 'stumbled' upon the California Northern, a regional railroad that began operations in the early 90's, and discovered this runs over former SP tracks. The CFNR in it's start up years, operated with SP equipment, until enough 'own' locomotives appeared on the roster, but SP retained a couple of trains on the routes in these years until it's merger with UP, about 3-4 years later. 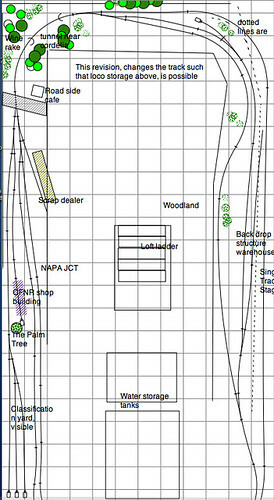 The plan slowly grew (almost unavoidable for any model railroader), and the left side was now loosely based on the maintenance yard near American Canyon (Napa Junction). I decided to model the area with a couple of compromises, but am aiming to get the feel of that area. I did not have space for the WYE nearby, so left that out. However I've scratch build the engineshops, using Google Earth, and Bing etc as my sources, along with some photo's I found on the net. The building dimensions are entirely guestimated, and I build it a little shorter than the real thing, for lack of space, but it has the right feel to it. A picture of the area is visible in an earlier post. Further down the line we find Cordelia Tunnel, from which the line continues and eventually (via Davis) ends up in Sacramento, but also goes north via the former SP West valley sub towards Woodlands, Corning, etc, while the other side of the wye on the real CFNR , goes via Suisuin to Willits. i decided to use Cordelia tunnel as a scenic divide. 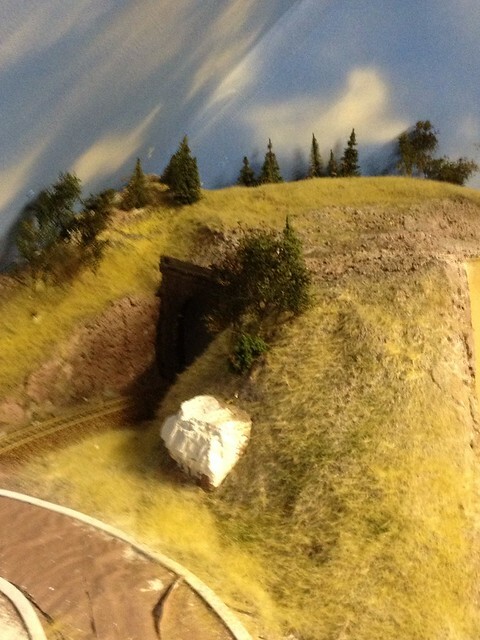 The west side will have a dryer/western CA feel, while on the other side of this tunnel, I will be modeling the line much further North a bit of a , where the scenery changes to a more forest type and lusher greens etc. As seen enroute to Willits. 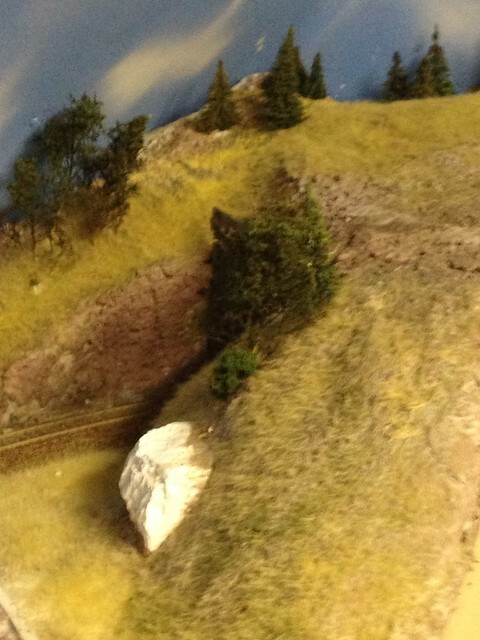 I haven't completely developed the scenery and locale for the right side yet, but my intention is to model a bit of the west valley sub around the track on the layout edge, using scenic divides (trees etc), and the small 2 track yard behind is actually on the pacific sub towards Willits. 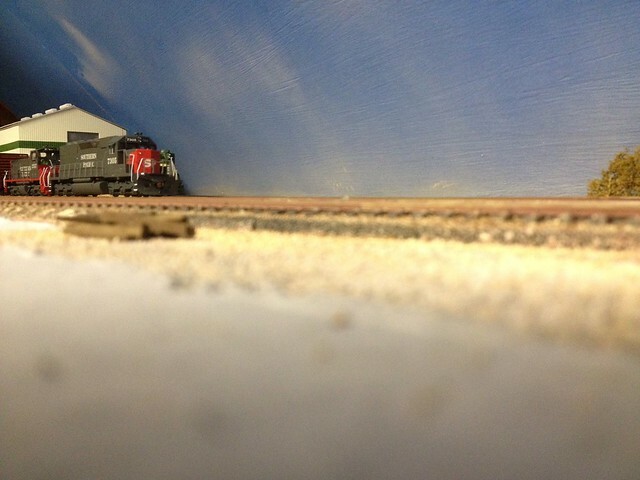 I've also taken significant liberty in making the line split on the East side of the tunnel, and one of these goes towards a single mainline 'staging' , behind the back drop and continues all the way around. Not only will this enable the storage of a train, but I can also make a longer run, or let a train run while doing some switching etc. 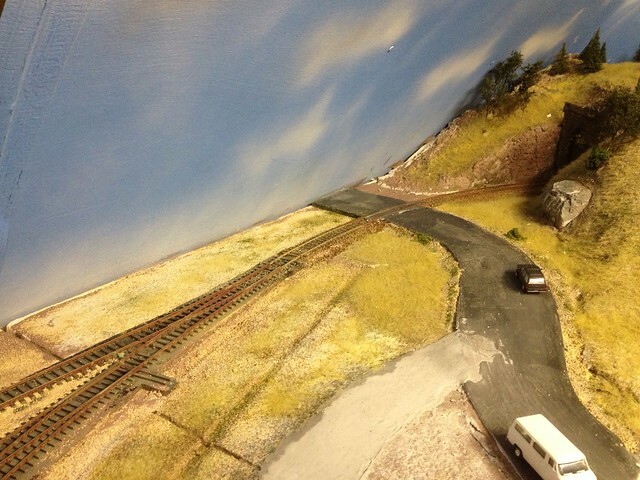 This is the (far from finished) area of Napa Jct on my layout. You can see the Locoshop building of the CFNR in the back ground, with CFNR SD9 203 being prepared for the next run north towards Willits to pick up lumber. An Eastbound SP local is preparing for departure. I've made a little progress on my home layout, and applied a layer of static grass as well as some trees at the Cordelia tunnel location. the stark white rock casting obviously still needs to get painted and weathered. I did use my tea strainer/flyswatter home brew applicator indeed. It's not too bad, I do find it a little bit difficult that it hasn't got a flat bottom, and if you're a bit too enthusiastic, grass can spill out of the top. After this application I misted over a 'haze' with the same spray can, as well as very careful accents to some clouds, making them a bit darker here and there, but only very subtly. When sieving ballast or soil with a tea strainer (last stage of sieving) I use a Pringle lid on the tea strainer held down with a finger. That's a good idea Mike, thanks, I'll have to get myself some Pringles and try that out in the near future. 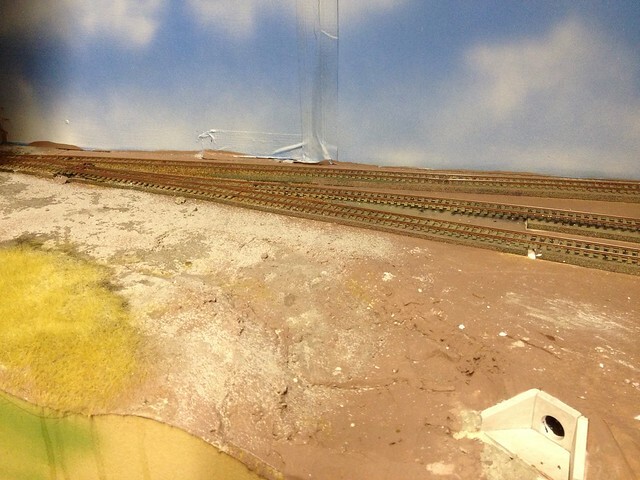 The last couple of days I've been busy on some scenery work on my layout. A few hours here and there. Among others I've added some roads (which still need more paint and weathering), and more ground cover (static grass etc), as well as painted more track a rusty brown colour so I can continue to ballast on another part. I've also started to erect and paint the fence that will go around the scrap yard area. Below are some random under construction photos. Very good, Koos. You are cracking on! Looking good, you are getting further than me with scenery. Thanks guys, got a bit further today, ballasted another section of track, still soaking wet on this picture. 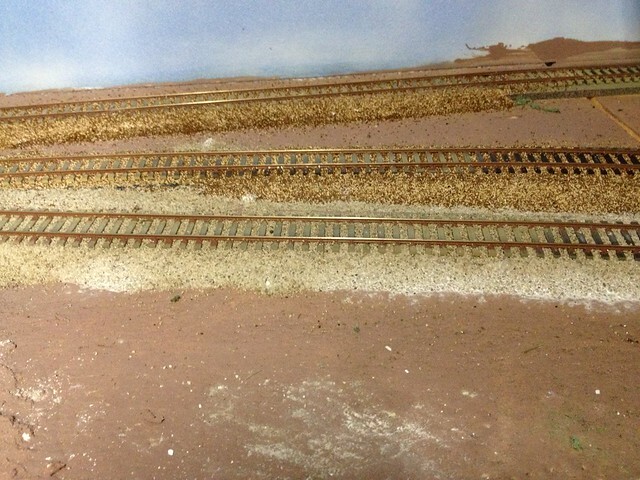 I am deliberately ballasting a section of track with different colour ballast, to replicate a freshly ballasted section. All ballast I use is ground cover for reptile vivariums/terrariums. 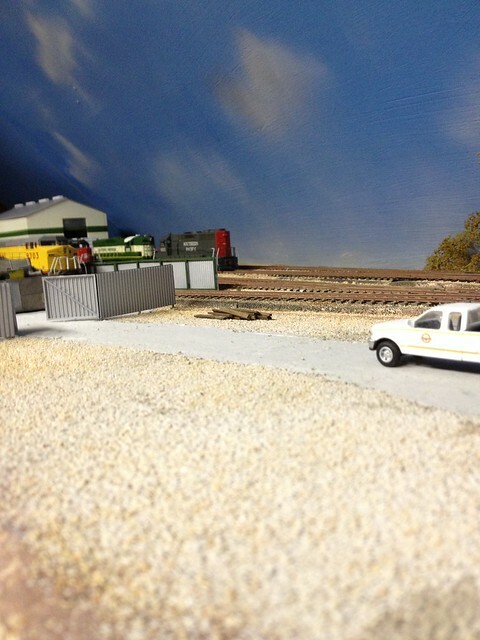 It is fine enough for HO scale, and a 5KG bag sets you back less than 4 pounds, no scenery maker can offer that value. the only cheaper solution might be to collect and sift your own ballast, but with the weather of late, that might not be an option. Here another shot of the SD40R + SW1500 consist at Napa Jct. You'll notice the scrap yard fence was not yet in place. Since changing locale for my Wolter Springs module, I could free up the SP loco, GP35 6521, I had 'reserved' for it, and put it in service on my home layout. 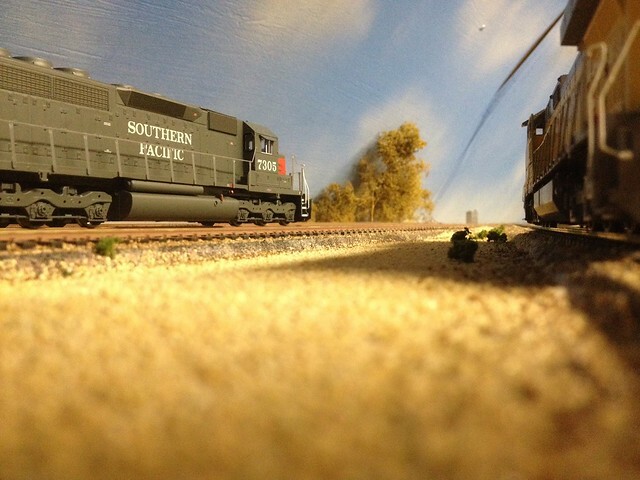 by the way behind the CFNR SD9 my scratchbuild SP woodchip gondola is visible. I'm still to paint it though but I haven't got the correct , or a reasonable paint to paint it with. 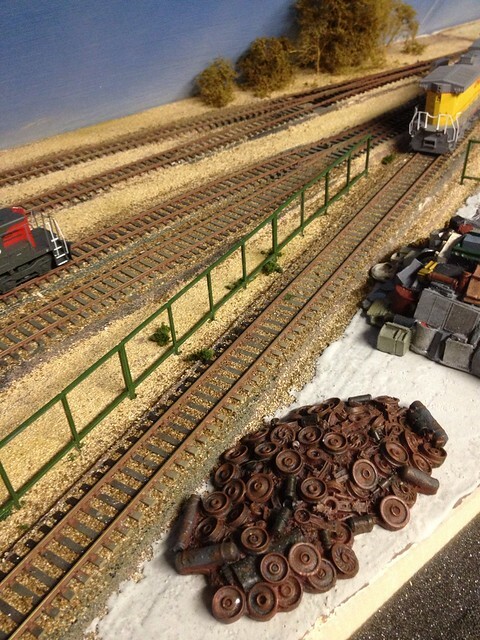 Dash-9s to the scrapyard eh!? Nice work Koos.